Turn a today craft into an instant heirloom with this easy aging technique. Copy the pattern lines onto typing paper, or photocopy the pattern. The pattern can be enlarged or decreased in size to suit your own taste on a photocopy machine. 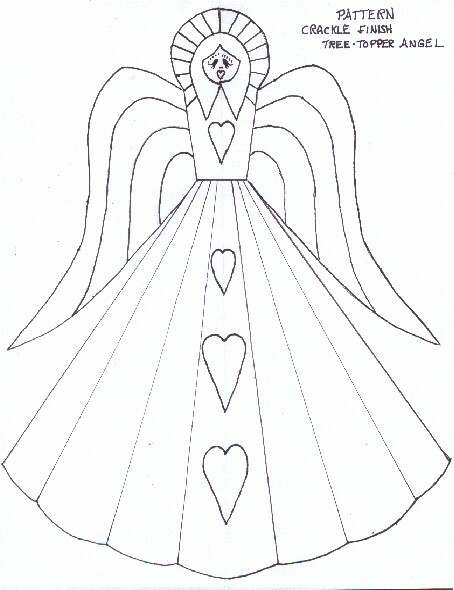 Transfer the outline of the angel onto poster board. You only need the outline at the moment. Cut out the angel using scissors. Mix white glue and black paint half and half. Using 1/2" brush, spread the mixture thickly to cover the entire shape of the angel, one side only. Allow to dry, or speed dry with a hair blow dryer. Optional: Repeat on the other side, covering the entire surface with paint mixture. This makes the finished project more durable. Dot several large globs of school mucilage onto the angel shape, and evenly spread it over the entire surface with 1/2" brush, which has been cleaned in water. Allow to dry for approx. 10 minutes, or speed dry for about 30 seconds with a blow dryer. Wash brush. Paint over the partially dried mucilage with Ivory paint with 1/2" brush. Allow about one to two minutes for the paint to establish it's crackle finish. Place the pattern over the dried, painted, crackled angel, and transfer the details onto the surface. Use a ruler and a pencil to draw the straight lines. To transfer the details, rub a pencil on the back of the pattern to establish a graphite back on the pattern, place the pattern over the painted angel, and draw over the details of the angel. Enough pencil markings should be left on the angel so that you can use them as a guideline for the finish painting, if not, using a pencil, define them a but more using the faint pencil transfer lines as a guide. Mix Wine paint and Ivory paint to establish a pink color for the face. Using a small round brush, paint in the face. Darken the pink color with a bit more wine color, and paint in the hearts. Paint the hair with Metallic Gold. When dry, paint the eyes using a liner brush and black paint. With liner brush, add all the Metallic Gold lines around the halo, the wings, and the dress folds. Also outline the hearts. Paint a line of Metallic Gold all around the outside edges of the angel. by painting all the surfaces with clear varnish. The angel may be glued closed permanently, or held closed with a paper clip so that it can be stored flat. This craft reprinted courtesy of Craftbits.com. Our website was created by a mother and daughter team, adding a unique combination of crafting qualities and expertise of creativity. We started our website after numerous years in the area of craft, teaching, retail craft and owning a gift store. We decided to launch it to provide resources for teachers, therapists, and craft enthusiasts in the year 1999. Since then, the website has grown tremendously in terms of content and resource information.